Cork wall tiles 3D Stripe & Line - Experts in cork products! 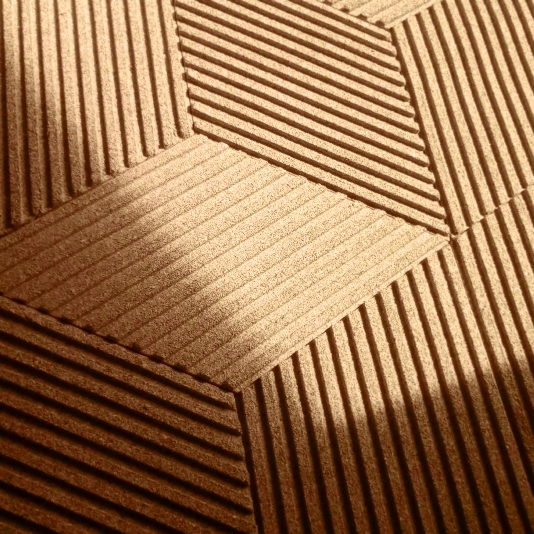 What are 3D Stripe & Line cork tiles? Decorative 3D Stripe & Line cork wall tiles are a unique example of original, yet minimalistic design. These natural cork panels, manufactured with the highest degree of precision and diligence, will fit perfectly to every interior: an office, a commercial building and a housing estate. They will add a touch of uniqueness, coziness and sophistication to every design. What inspired us to create them? The inspiration for our current and future products has always been and will be nature. Its durability, timelessness and uniqueness astonish everybody. Thanks to the tiles’ shape, which is well thought out, you can install them in the same direction and create symmetrical patterns but they can also be arranged in a completely different way, which allows you to build unique compositions. Designer 3D Stripe & Line cork wall covering is 100% environmentally friendly. All cork wall panels are made of sustainable and renewable raw material which can be recycled and is completely biodegradable, namely natural cork.